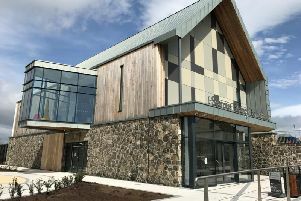 A man spotted on CCTV chasing another man along the street and jumping on him, was placed on probation for 18 months at Magherafelt Magistrates Court. Conrad Martin Sheerin (24), of Foreglen Road, Dungiven, was also ordered to carry out 80 hours of Community Service for disorderly behaviour. District Judge Alan White made it a condition of the probation that defendant takes part in the Thinking Skills Programme. Mr White warned Sheerin that probation was an alternative to immediate custody and, if he failed to complete the order, he would serve time. A prosecuting lawyer said at 2.25am on September 6 last, police received a report of two males fighting and one of them was “lying on the ground” at Queen Street in Magherafelt. Counsel said viewing CCTV footage of the incident the defendant was observed chasing the other male along the street and jumping on him and punching him a number of times. Pleading with the court for leniency defence barrister Liam McStay said Sheerin was a hard working young man from a good background. He said like many young men in their 20’s, Sheerin liked to “play hard and drink hard”. However, Mr McStay stressed the defendant was doing himself no favours and was letting himself down through alcohol and his temper.